Olivier Giroud is also a wanted man and Leicester City are planning a clear-out. 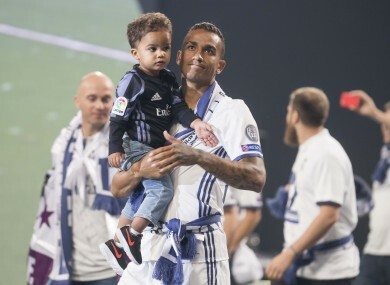 Danilo and his son after winning the Champions League with Real Madrid. Croatian winger Ivan Perisic has been mooted as one of Manchester United’s main transfer targets this summer and the 28-year-old is said to be keen on a switch to the Premier League. However, Inter Milan sporting director Piero Ausilio has told Sky Sport Italia that the deal is “not going to happen”. Premier League champions Chelsea are reportedly favourites to clinch the signature of Real Madrid full-back Danilo for £31 million, and they are also in for his former Porto team-mate Alex Sandro — with Juventus valuing the Brazilian at a whopping £70m. Meanwhile, Stoke City have emerged as favourites to bring in Frenchman Kurt Zouma on loan from the Blues. The Frenchman looks set to sign a new four-year deal but will then be farmed out to another Premier League club. West Brom are also monitoring the situation. Marko Arnautovic is a player who wants out of Stoke, but the Potters have rejected a bid of around £20m from West Ham for the Austrian international. A year ago, Leicester City spent somewhere in the region of £60m on Islam Slimani, Ahmed Musa, Nampalys Mendy, Ron-Robert Zieler and Bartosz Kapustka. Zieler departed for Stuttgart earlier this week, and the Foxes are reportedly looking at the possibility of offloading the others this summer. In other Leicester-related tittle-tattle, Roma would like to replace Liverpool’s recent buy Mohamed Salah with Riyad Mahrez. Finally, Arsenal’s beautiful centre forward Olivier Giroud is a target for Borussia Dormtund, West Ham, Everton and Marseille. Back in October 2001, Leeds United parted ways with £7m to secure the services of young English prospect Seth Johnson from Derby County. The midfielder had already made his international debut against Italy in Turin, but the story goes that the player’s agent could hardly believe his luck when Leeds chairman Peter Risdale offered his client £37,000-a-week. In four years at the club, Johnson only managed 50-odd appearances as the Yorkshire club were relegated from the Premier League. After his release in 2005, Johnson rejoined Derby. Email “Inter rule out Perisic to Man United, Chelsea close in on Real Madrid defender and today's transfer gossip”. Feedback on “Inter rule out Perisic to Man United, Chelsea close in on Real Madrid defender and today's transfer gossip”.